Cheers to Caudalie for creating this refreshing collection of Vinotherpie products designed to cleanse and pamper your skin. I tried the Cleansing Water for Face and Eyes and found it a nice alternative to traditional foaming cleansers and makeup removers. Great for even the most sensitive skin, this micellar water captures dirt and washes it away without rubbing. Plus, it has soothing and hydrating ingredients like grape, chamomile, plant glycerine, mint and caraway to clean and invigorate skin. Just use a cotton pad to apply to face and eyes in the AM and PM. According to the directions, you don't have to rinse it off but it felt a bit sticky at first so I dabbed it with a few drops which helped. I also smoothed some over my eyelids after a late night party and watched the makeup slide off--no need for pulling or rubbing. The next day my face felt smooth and soft, so I was eager to try the Merlot Shower Gel as well. This plant-based, soap-free gel lathers up and feels smooth all over your body. Warm red currant and red vine leaves give it a subtly sweet scent. If you like these products, try the Day Perfecting Cream too. It's ultra-moisturizing and offers antioxidant benefits. 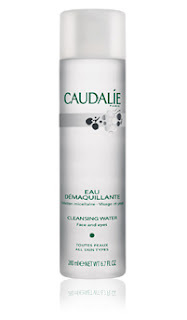 For more info on Caudalie, go to www.caudalie-usa.com. help for dry skin: mayday! mayday! Got dry, irritated, chapped or peeling skin? I do. I have been known to try every extra-emollient, ultra-rich skin cream out there in the hopes it works its magic on my rough elbows and knees. While some work better than others, I have always liked the texture of thick petroleum-based formulas more than those with a cream base. For some reason, they just feel more healing. That's one of the reasons why I love Ren Skincare's Mayday Mayday Rescue Balm with Bio Actives, which hit stores in April. Designed to deeply moisturize, soothe and strengthen dry skin with Omega 6 essential fatty acids and trigyceride-rich Shea Butter, it's great for really dry hands, elbows, knees and lips. It feels really soft when you smooth it on and absorbs quickly without feeling greasy. After just two uses, my knees felt much smoother. And I LOVE the fresh scent! I'm not sure what the ingredient is that's responsible (maybe the soothing chamomile and pink violet) but it makes you smell like you've just left the spa. It comes in a palm-size tube that fits easily in your hand (although I'm sure I'll need more very soon!) and is packaged in a simple white box with purple accents. And--not that this is a reason to buy a skincare product--I love the pretty graphic design on the inside cover. It's a nice surprise when you open the box! Get your dose of Bio Actives at Space.NK, Sephora, Blue MercuryBarney's, Fred Segal and www.RENSkincare.com.